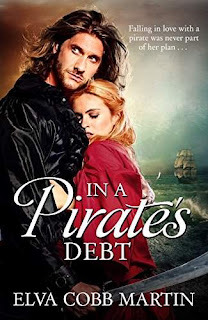 Travay flees a forced marriage and falls into the hands of a pirate. When she gains consciousness after her rescue from the Caribbean, a man enters her cabin aboard ship. Sunshine and a spicy scent come in with him. Even with a day's beard shadowing his firm jaw, he's a most handsome man. A billowy-sleeved white shirt clings to his lean torso and a crimson sash overlaid with leather crosses one shoulder. Two pistols protrude from his baldric and a sword gleams at his side. Who was he?